uncompromising and twisted imagination. . . . [This book] searches a city's heart and mind rather than its avenues and public buildings. "—New York Times Book Review"This short, crisp, fighting creed is both a social document and a love poem, a script in which a lover explains his city's recurring ruthlessness and latent power; in which an artist recognizes that these are portents not of death, but of life. "—New York Herald TribuneNelson Algren (1909-1981) won the National Book Award in 1950 for The Man with the Golden Arm. His other works include Walk on the Wild Side, The Neon Wilderness, and Conversations with Nelson Algren, the last available from the University of Chicago Press. David Schmittgens teaches English at St. Ignatius College Prep in Chicago, Illinois. Bill Savage is a lecturer at Northwestern University and coeditor of the 50th Anniversary Critical Edition of The Man with the Golden Arm. Algren's first novel, Somebody in Boots, was published in 1935. His second novel, Never Come Morning, was published in 1942. The book was banned from the Chicago Public Library. 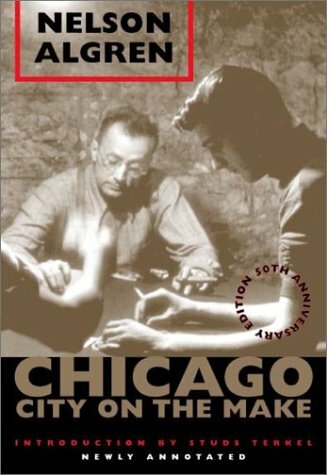 Algren received a 1947 Award from the American Academy of Arts and Letters and a grant from Chicago's Newberry Library. In 1949, Algren published The Man with the Golden Arm. The book won the National Book Award and was adapted as a film in 1956. Another book, A Walk on the Wild Side, was also adapted for film in 1962. Algren died in Sag Harbor, New York, on May 9, 1981.